Mr. Kwaku Agyenim Boateng, Deputy Minister for Railways Development has met the timber market operators in Ashaiman to dialogue over expansion of railway lines. 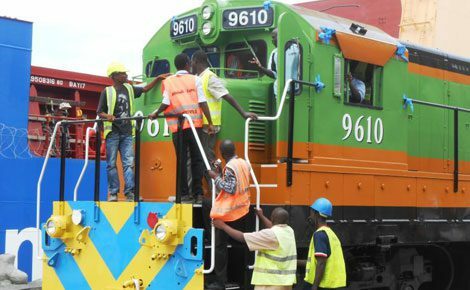 The 95-kilometre railway starting from Tema, would pass through Ashaiman to Mpakadan in the Volta Region and has parts of the lands encroached at the Ashaiman timber market area, resulting in the railways authority to negotiate for work to begin. Mr Agyenim Boateng in addressing the media noted that they were having a stakeholders meeting, which would engage the engineers, designers and the encroachers. “We are engaging stakeholders on the railway lines…the timber market association has asked for a fifty-foot reservation but we will have to meet and discuss the engineers and designers before decision would be taken. “We are taking a holistic view of the whole process to make sure that as minimal demolition takes place…we are doing this development to benefit the people, so they must be included in our decision taking’ he added. Mr Solomon Appiah, District Chief Executive, Kpone-Katamanso District Assembly (KKDA), on his part urged the timber market association to be very objective and allow work to commence on the railway lines, which would benefit them in so many ways. “We have had a lot of petitions from the association but we are going through to see the possible ways to handle the issue. We must get the work done so that transporting goods to other parts of the country would be easy…trains are very cheap and fast to convey people and goods to and fro”. In an interview with Ghana News Agency (GNA), Mr Anthony Partey Asare, chairman, Ashaiman timber market association welcomed the decision to reduce a demolition that would have affected about 700 houses to 120, but still asked to cut the number down. “We are quite okay from the way the Deputy Minister spoke…they have been able to help cut the affected houses down to 120 and that is remarkable, but we hope and pray it goes further down. “We love the project and the whole idea of getting the railway lines through Ashaiman but we are only concerned it doesn’t affect our livelihood” he said. According to Mr Agyenim Boateng, the 50 feet reservation proposed by the association has not been agreed yet but subject to reviews and agreement from the engineers and designers. The three year contract, which is worth around $398 million, would see trains that runs at 120 km per hour plying the Tema-Ashaiman root to Mpakadan on a stretch of 95km. Mr Ken Ofori-Atta, the Minister of Finance, has stated that in order to promote economic opportunities for women, special considerations would be given to women in Government’s procurement. Mr Ofori-Atta, said this when he delivered the 2018 budget statement on the theme “Putting Ghana Back to Work”, in Accra on Wednesday.